Following on the heels of very constructive meetings with high-level officials of the Government of Japan, Hon. 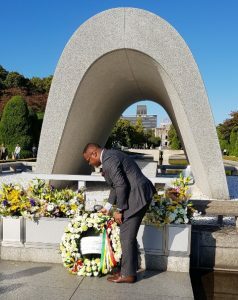 Brantley, Minister of Foreign Affairs and Aviation in St. Kitts and Nevis visited the Hiroshima Peace Memorial Park, in Hiroshima City on November 03, 2018, where he signed the visitor’s book and laid a wreath in honour of the thousands of lives that were lost after the world’s first atomic bombing on August 06, 1945. The following is an announcement from the Inland Revenue Department on Nevis regarding change in opening hours to facilitate week of activities.